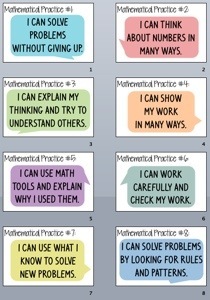 Posted on February 7, 2014 February 9, 2014 by Clara Maxcy (Cleargrace)Posted in CCSS, Education, Mathematics, Teaching StrategiesTagged mathematical practices, students. Previous Previous post: Why do we teach math? This teacher’s honest answer. Next Next post: What rules do you live by? Are your rules building community? or are they building walls?